WASHINGTON — Drawing a page from turn-of-the-century populists, Democrats running for president are increasingly railing against monopoly power on the campaign trail, as candidates embrace policies aimed at breaking up conglomerates and cracking down on practices they say weaken competition. The conversation touches on numerous areas of the economy: Wall Street, hospitals, drug companies and, increasingly, big tech. It's a shift from prior elections, when questions about the scale of big business were often a niche issue behind other economic debates. "Anti-trust had really been a dead language for 40 years on both the left and right," Sarah Miller, deputy director of the Open Markets Institute, an anti-monopoly think tank that's co-hosting a 2020 candidate forum on the topic in Iowa on Saturday. "In 2020, we're really seeing antitrust have a breakout moment." This week, agriculture was in the spotlight as Sen. Elizabeth Warren, D-Mass., put out a multipart plan to dismantle agricultural giants and prevent future mergers. Small farmers in the state, who contract with larger companies to buy supplies and sell crops and livestock, complain they're getting squeezed as a handful of conglomerates dominate the market. "To start, we must address consolidation in the agriculture sector, which is leaving family farmers with fewer choices, thinner margins and less independence," Warren wrote in an op-ed on Medium. Days later, Sen. Bernie Sanders, I-Vt. wrote an op-ed of his own in The Des Moines Register that joined Warren in condemning a recently approved merger between Bayer and Monsanto. Not to be outdone, Sen. Cory Booker, D-N.J., railed against consolidation in the poultry industry this month. In August, he put out legislationthat would block all mergers between large agricultural, food and beverage companies for an 18-month period. "Who has the right to compete in America?" Booker asked in a speech to the Open Markets Institute last year. "Is it just a handful of special interests and large consolidated corporations? Or is it a nation of freedom where everybody can compete? The political upside is clear in Iowa. 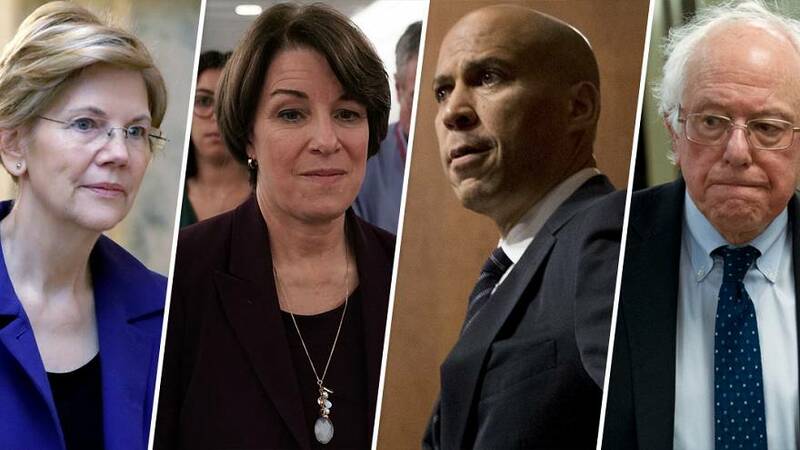 On Saturday, Warren is attending the Heartland Forum event in Storm Lake with two other 2020 Democratic candidates, Sen. Amy Klobuchar of Minnesota and former Rep. John Delaney of Maryland, as well as Rep. Tim Ryan of Ohio, to discuss corporate concentration in rural America. The event is sponsored by Open Markets Action, HuffPost, The Storm Lake Times, and the Iowa Farmers Union. But the latest proposals are also part of a larger trend in which Democrats look to distinguish themselves by taking aim at corporate practices they argue are anti-competitive. The movement gained new prominence after the 2016 race as the party looked to prove its credibility with blue-collar voters. Senate Democrats made anti-monopoly policy a key part of their Better Deal package, a set of priorities to guide them through the next election cycle. "Plenty of people who you would affiliate with the center of the Democratic Party started saying openly we needed a more vigorous antitrust policy," Marshall Steinbaum, a fellow at the Roosevelt Institute who researches the topic, told NBC News. Warren, who helped popularize the new antitrust movement, has tried to corner the market early in the presidential race. In addition to her agriculture plan, she put out a sweeping proposal this month to appoint regulators who could potentially break up Amazon, Google and Facebook, who she wrote have " too much power over our economy, our society and our democracy." She's proposed designating the trio, along with related companies worth over $25 billion, as "platform utilities" that should not be allowed to use their websites to promote their own products. Still, the primary is a free market — and she has competition. Klobuchar, the ranking Democrat on the antitrust subcommittee, has also made corporate consolidation a target in speeches and interviews. In 2017, she put out legislation that would place a higher burden on companies seeking federal approval for a merger. "We have a major monopoly problem," she told The Washington Postthis month. Underlying the resurgent antitrust movement is an argument that the government needs to take a broader view on the economic effects of larger companies. For the last several decades, there's been a broad legal consensus that courts and regulators should look to "consumer welfare" — whether a merger will allow a company to jack up prices or otherwise hurt customers — as the standard for harm. But Democratic presidential contenders argue regulators should take into account whether larger corporations might block new startups, crowd out local businesses or push down wages by giving employees fewer work options, even if the end result is cheaper products for customers. The hot word in Democratic policy circles these days is "monopsony," a scenario in which a few businesses dominate the labor market, giving them more leverage over wages and benefits as employees have fewer options if they want to leave. Some economists see it as a possible explanationfor why wages have lagged behind economic growth since the recession. "The rise of concentration across U.S. industries has helped create a labor market in which fewer workers are able to fairly bargain with their employers to set their wages on competitive terms," Booker wrote in a letter on the issue to the Federal Trade Commission in 2017. In a related policy push, Booker and Warren have pursued legislation to curb "no-poach" clauses in worker contracts that prevent them from being hired by other franchises within the same company. On the other side of the aisle, Republicans have shown some renewed concern about big tech as conservatives grow skeptical of social media companies' handling of speech and privacy. The Justice Department also sought to prevent a mergerbetween Time Warner and AT&T. President Donald Trump's position is a subject of debate in antitrust circles, with some concerned that he views the policy as a means to target news outlets he dislikes, like CNN, which is owned by Time Warner, and The Washington Post, which is owned by Amazon founder Jeff Bezos. Administration officials working on the issue deny that he has influenced their position. Critics argue that the antitrust movement exaggerates the harm of market concentration and that new competition can come from unexpected places. "There's always a boogeyman," said Tyler Cowen, an economics professor at George Mason University and author of "Big Business: A Love Letter to an American Anti-Hero." "In the '90s, it was how Walmart is terrible and no one can compete against Walmart," he said. "Then it was Amazon, who competes against Walmart." But with Democrats looking to show they can stand up to large corporations, expect plenty more emphasis on monopoly power. It might be how the eventual nominee puts their competitors out of business.